Priced at under $2,500 the Legion Y740 brings big RTX 2080 graphics power to the masses. Gamers looking for an ultra-powerful laptop have a wide range of choices. In 2019, a lot of laptops in the $2,000 range can offer up big power for the price thanks to the Nvidia RTX 20-series graphics cards stuffed inside. We’ve seen the Razer Blade, and the ROG Zephyrus S GX701 so far, but Lenovo too has an option. 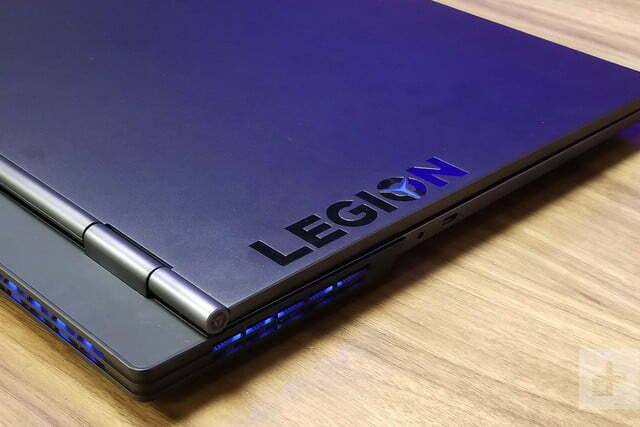 Enter the 17-inch Legion Y740. Coming configured with the Intel Core i7-8750H processor, Nvidia GeForce RTX 2080 Max-Q graphics, 16GB of RAM, and a 256GB PCIe NVMe SSD paired with a 1TB HDD, it’s one big beast. But priced at $2,300 how does Lenovo’s Legion stand up when put against the best from Asus, or Razer? Wait, that’s a gaming laptop? 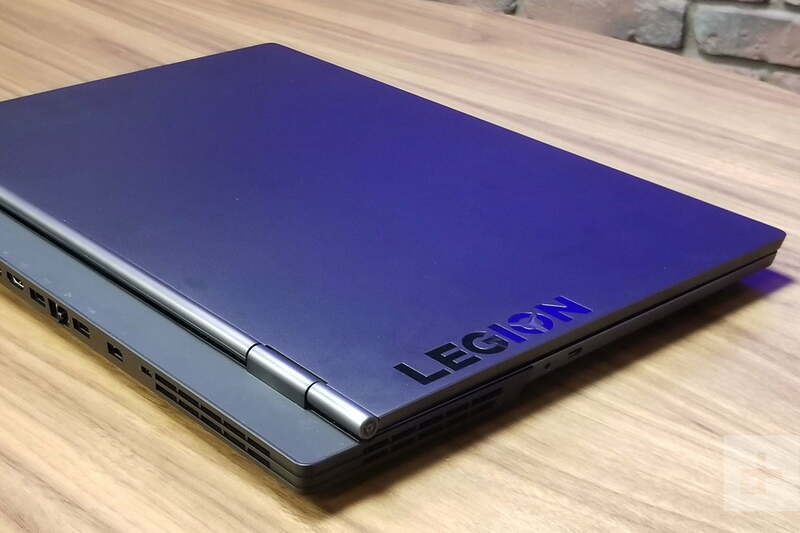 As I first unboxed the Legion Y740, one of my coworkers asked me, “That’s a gaming laptop?” He seemed a bit shocked, but he is quite right to ask. While the Legion Y740 is quite big and heavy, it isn’t as flashy as the options from Alienware or Predator. No futuristic or sci-fi looks here. Instead, it keeps to a simplistic, plain boxy style, with an aluminum lid and slate effect that looks more like something from a ThinkPad. This design choice is not new and is making a return from last year’s Legion Y730. Still, the Legion Y740 is huge. I tried taking it home with me, and it was a pain just to fit in my backpack. It measures in at almost 0.86 inches thick, and at 6.4 pounds in weight. That’s well-off the Asus ROG Zephyrus S, which comes in at 0.73 inches thick, and 5.9 pounds. It’s even a bit distanced from the Razer Blade, which is 0.7 inches thick and 4.5 pounds. But it’s not all at a loss. All that weight means the Legion Y740 is solid. Its lid is free of flexing, and the keyboard deck doesn’t budge inwards when I pressed on it. 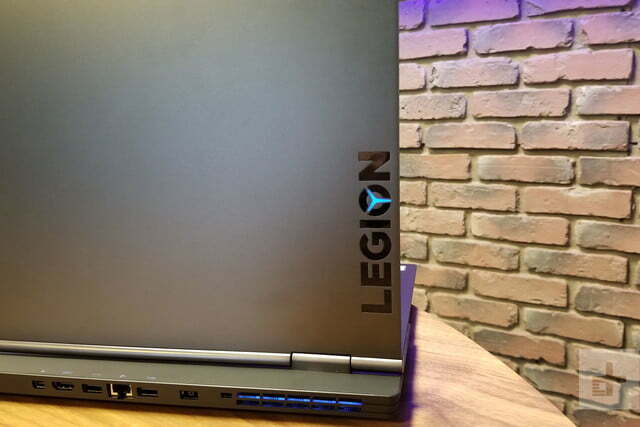 The lid even has a spot for Lenovo’s Legion logo, which has customizable lighting. I still would have liked for Lenovo to slim down the bezels on the Legion Y740 a bit to match the smaller 15-inch version. In an era where laptops like the Razer Blade can be virtually borderless, I really expect the same out of newer gaming laptops. The thick bezels often stared me down and made games feel a bit less immersive than I hoped. Lenovo does make up for that with something that makes the Legion Y740 quite unique. Its most important ports are positioned along the rear, right where the hinge juts out from the slate-like platform that supports it. The selection there includes, ethernet, mini-DisplayPort, HDMI 2.0, and two USB-A ports. On the right side, the choices include USB-A. That is followed by Thunderbolt 3 on the left side. As HDMI and power ports are on the rear, that means for a mess-free cable management. Ports on the back are even lit for convenience, making gaming in the dark even easier. 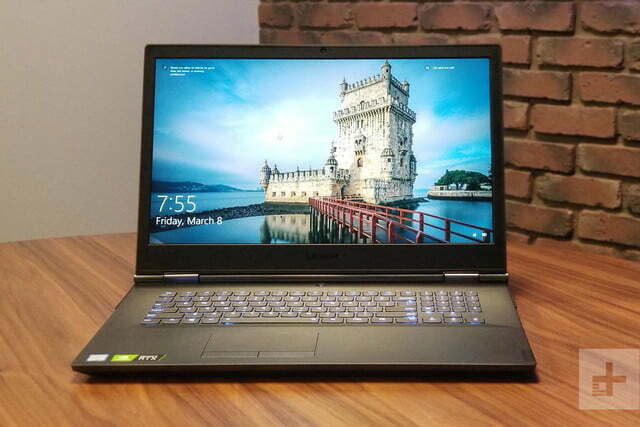 While laptops like the Alienware Area-51m or the Razer Blade Pro feature mechanical keyboards, the Legion Y740 is quite the opposite. Its keyboard is more like something off a Lenovo IdeaPad, in that the keycaps provide a soft feeling. Flat keycaps meant I had to be extra careful when typing through Word documents, but it was something I grew used to over a few days. For gaming, the keyboard has accuracy. It features 100 percent anti-ghosting and offers up to less than a 1 millisecond response time. I experienced no delays when mashing keys to race through arenas in Rocket League. Though there is a number pad, I would have liked to see the addition of macro keys, but it doesn’t look like there was enough room in the chassis for it. It’s also very colorful. Lenovo is offering a highly customizable RGB lighting system via Corsair iCUE lighting software. While navigating the software is a bit tricky, color customizations can expand to the side vents of the system, for the ultimate gaming look and setup. You also can customize the lighting on the keyboard into individual zones, with an endless amount of profiles. 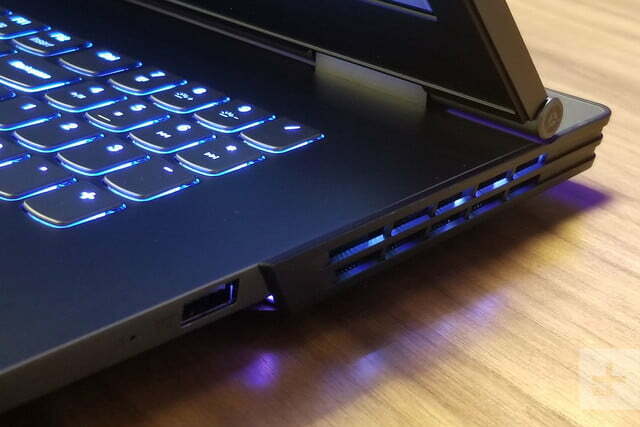 That rivals the customizable ring of light found on the rear of the Alienware Area-51-m.
As for the mylar-coated touchpad, it is small when compared to what you can find on board the 15-inch Razer Blade. This mylar material is a mix of polyester and is a bit softer than glass, but still provides a smooth surface for scrolling and gestures with Windows 10’s precision drivers. The left and right buttons are especially clicky and provide solid feedback when pressed. This is usually an afterthought in most gaming laptops — since an external mouse is usually the option — but it’s nice to see Lenovo paying attention to the details. The 17-inch 144Hz panel packed onboard the Legion Y740 is perfect for gaming. It’s an IPS matte panel, which helps keep away glares at most viewing angles. Like the Asus ROG Zephyrus S GX701, Lenovo bundles in support for G-Sync. This means which means that you’ll be able to get super-smooth framerates in fast-paced games like Forza Motorsport 7. The display also measures up nicely against the competition, coming in with a good color gamut and low average color error. Put into the real world, this means colors are very accurate, both for gamers and even those who might be content creators. Its contrast ratio is also decent. Higher is better, and the Legion Y740 is rated at 700:1 according to our colorimeter. That beats out the Razer Blade but can’t match the Zephyrus S GX701. Brightness is around the 300 nit range, which is just fine for a matte screen. The Dolby Atmos speakers on board the Legion Y740 are great too. Cranked up to just a medium level, I was able to feel vibrations of gunshots echo through the desk when playing Battlefield V. This means headphones were an afterthought, as the audio experience was truly immersive. 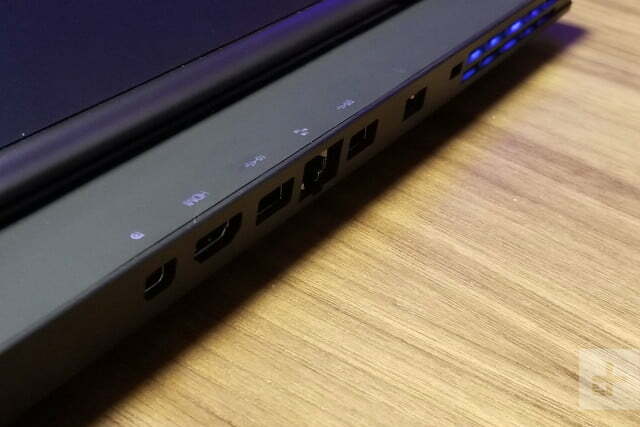 Lenovo accomplishes this by tucking away the speakers on the left and right corners of the laptop. The audio never once blew out or crackled when set at full volume. Even the noises of the fan during gameplay don’t ruin the overall experience. A laptop like the Legion Y740 might be for gaming, but it also serves as a capable productivity machine. Under the hood, the Legion Y740 features the Intel Core i7-8750H processor clocked at 2.2 GHz alongside 16GB RAM. It also has a 256GB Samsung PCIe NVMe SSD, paired with a 1TB Seagate HDD. To test all this raw power, we headed to Geekbench first. In its multi-core performance, the Legion Y740 punches just slightly ahead of both the Razer Blade and the Zephyrus S GX701. 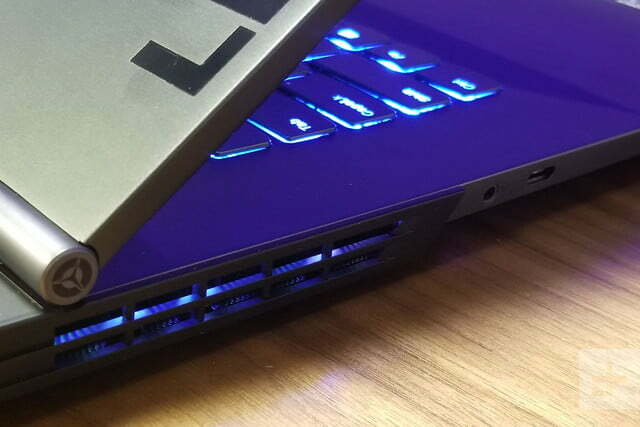 A similar story applies for the multi-core scores, which puts the Legion in the 22,000 range, ahead of most the gaming laptops we have tested in 2019. In more real world-scenarios, the Legion still manages to impress. 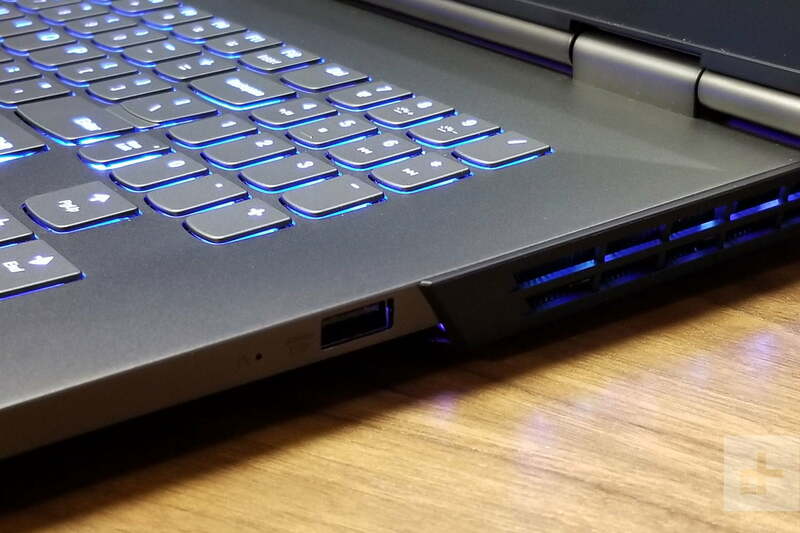 The gaming laptop encodes a video in 140 seconds, coming close to the record set by the Zephyrus S GX701. Lenovo is using special “Coldfront Cooling,” which cools both the CPU and the GPU individually with dedicated heatsinks and fans on the bottom of the system. The system serves its purpose and keeps the laptop cool, all while staying plenty efficient for intensive tasks like video encoding. The PCIe NMVe Samsung SSD built into the Legion is also fast. Its read speeds were well over 3,000 megabytes per second, and the write speeds were at 1,300 megabytes per second. It should be noted that the cheaper configurations of the Y740 use a mechanical hard drive, which is unfortunate. You can, however, upgrade the RAM and storage as you see fit in the future. Those components are not soldered on, and getting into the system requires just undoing some screws on the underside. From ray tracing to DLSS, Nvidia’s 20-series RTX desktop graphics cards received plenty of hype, and there’s good reason as to why. The RTX 2080 Max-Q packed inside the Legion Y740 brings a ton of raw power for gaming, making it one truly powerful machine. The results are best seen in 3DMark Fire Strike benchmarks. In this intensive testing, the RTX 2080 showed a lot of power. With a score of 16,793 It came on top of both the Razer Blade 2019 with the RTX 2070 Max-Q graphics. That is a bit off the Zephyrus S GX701 with the RTX 2080, but the performance in games makes up for it. In actual games, there isn’t anything that the Legion Y740 couldn’t handle. Pushing it to the limit on Epic settings in Fortnite bumped framerates to 119 FPS and bumping the settings to high led to 154 FPS result. Battlefield V felt super smooth too, with FPS peaking at 103 on Medium settings and 120 on Ultra. Even a much more demanding game like Assassin’s Creed Odyssey performed well, getting over the playable 60 FPS point. Compared to other gaming laptops with RTX 20-series graphics cards, the gaming performance on the Legion Y740 is excellent. When set at 1080p and Epic settings in Fortnite, the Legion Y740 edged out the Razer Blade’s 90 FPS, a full 30 frame difference. It also fared well in Civilization VI on Ultra settings, netting a 125 FPS high mark. That beats out the 95 FPS on the Zephyrus S GX701 and slightly edges out the 114 FPS on the Razer Blade. 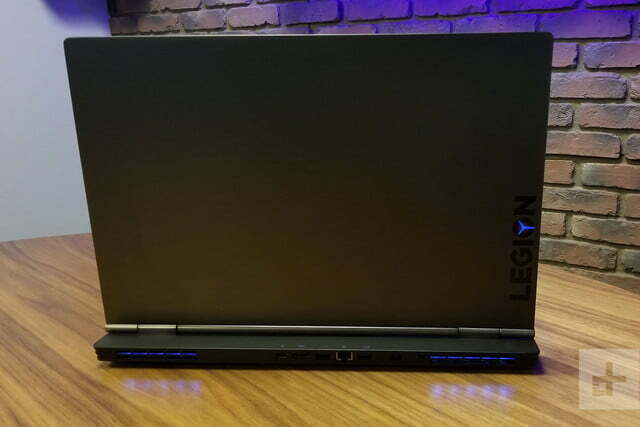 The Lenovo Legion Y740 has everything what it takes to fully enjoy games like Fortnite and Battlefield V.
In a similar matter, The Legion Y740 barely passed the ROG Zephyrus S GX701 in Assassin’s Creed Odyssey. Testing at 1080p on ultra settings, it achieved 56 FPS, pushing slightly over the 48 FPS on the ROG Zephyrus S GX701 and the 50 FPS rate on the Razer Blade. Even with all the RTX graphics power under the hood the Legion Y740 manages to stay cool. During intense online matches in Battlefield V, the palm rests never became too hot to the touch. Heat flow is instead directed to the areas near the top-rear of the keyboard and near the power button. In our testing, CPU temperatures peaked at 79 degrees Celsius, and the GPU hit a maximum of 61 degrees. Lenovo’s “Coldfront” dual-channel thermal system keeps up and help increase the airflow and cool things down. All the power under the hood of the Legion Y740 comes at the sacrifice of battery life. With the screen configured to a brightness of 100 lux, the 76 watt-hour battery couldn’t last very long in most our tests. Best example? When looping a 1080p video trailer, the built in 76 watt-hour battery lasted just three hours. That typically is our least demanding test. In web browsing, it also went on for roughly the same time. In all our tests, the Legion still fell well ahead of the two hours on the Zephyrus S GX701, but behind the five hours on the Razer Blade. Either way, this is not as great as the 14 hour battery life record set by the Dell XPS 15. However, the Legion Y740 does support Optimus graphics switching, which disables the power-hungry NVIDIA graphics in favor of the integrated Intel graphics. This can be accomplished through the Bios, or through the Nvidia GeForce Experience. When enabled, it led to modest improvements. The battery lasted for roughly two hours longer in our web browsing and three hours video playback testing. At around five hours, that’s still behind the seven or eight hours of battery life we get in most laptops without dedicated graphics like the HP Spectre X360. 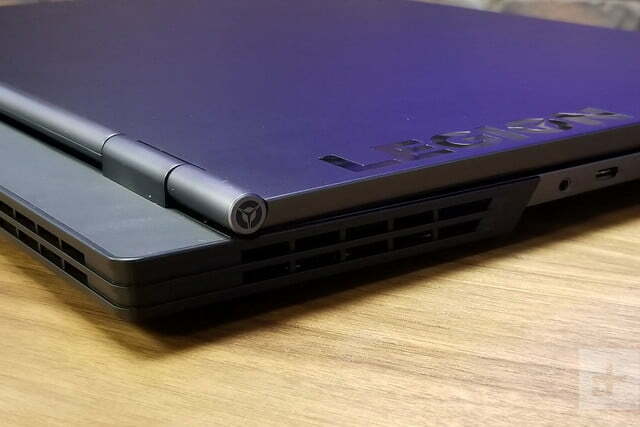 With it’s a non-flashy Thinkpad-like design, the Lenovo Legion Y740 is an excellent gaming laptop packing all the performance need for modern gaming. Unfortunately, the lack of a mechanical keyboard and poor battery life hold it back from being perfect. 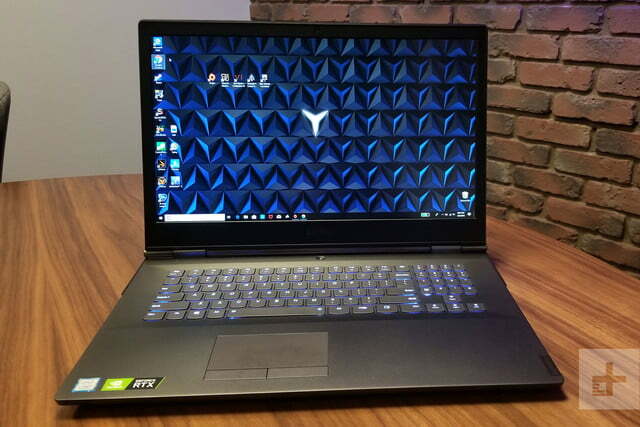 At CES 2019, roughly 40 gaming laptops were announced with RTX-20 series graphics inside. 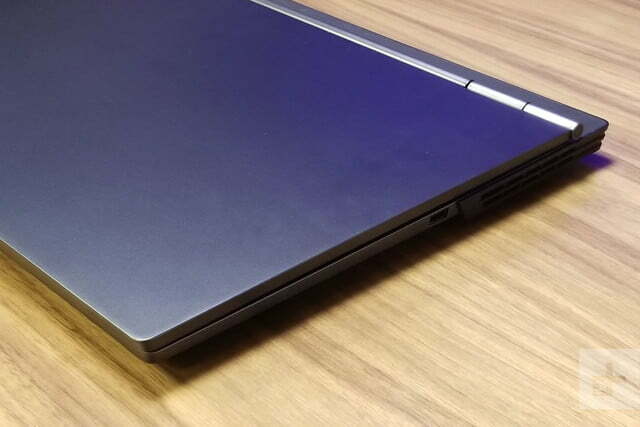 The laptops come with similar specifications as the Legion Y740, so there are currently plenty of alternatives. Leading options include the Razer Blade, as well as the MSI GS75 Stealth. In a similar $2,400 price range, the 15-inch Razer Blade is an option that is thinner and lighter, but still packs in the gaming power of the RTX 2070 Max-Q. You’ll need to pay considerably more to go up to a 2080 Max-Q. The 17-inch MSI GS75 Stealth is a similar story. Both comes with slimmer bezels and are more portable than the Legion Y740. Meanwhile, a cheaper 15-inch version of the Legion Y740 is also available, with RTX-2070 Max-Q graphics. Yes. With an RTX 2080 Max-Q graphics card, the performance on the Legion Y740 is there for big box gaming. Priced at $2,320 It is currently cheaper than the $3,300 Asus ROG Zephyrus S GX701 which has the same graphics card and similar base specs.